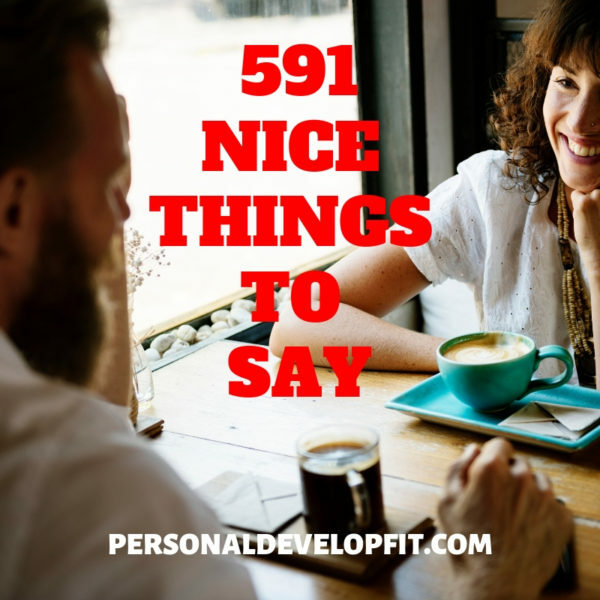 A list of 591 nice things to say to you can impact the people you care about most! There are so many nice things to say to people that when we say them, two things happen. They feel good and we feel good. People love to be complimented. We are all living in the same world. All in this together. All trying to do our best. And when people see the best in us, we feel recognized, respected, loved and appreciated. We feel significant. A need that needs to be fulfilled in us all. But what are good things to say to people in our lives? What will make people feel better because we said them? We’ll below I go into just that. Nice things to say to anyone and everyone. As well as examples of nice things to say to your significant other. Nice things to say to kids. Nice things to say to seniors. Nice things to say to your teacher. And even nice things to say to your ex! Your positive energy is palpable. I have learned and grown so much because of our relationship. You are always honest and real and I appreciate your authenticity. I love how good you are with children. You make me feel like I can be myself around you. You are always so clean. You are so goal driven. Thank you for being there for me in my rough times. You are the perfect example of what a best friend, mother, father, brother, sister, etc should be. Because of you I believe in my ability to succeed. Thank you for being yourself around me. You have the greatest laugh. That color of clothing looks amazing on you. I like how you treat everyone equality. I admire your sense of equality. You are so good at time management. You inspire me to be better at my job, as a mom, as a father, as a leader, etc. I can’t wait to live life with you as a friend, sibling, spouse, family member, etc. You have the whitest teeth. Or the best smile of all time! You always make my day when we hang out. I love the things you don’t like about yourself. I can always trust you and I love your for that. I always tell people how amazing you are. Spending time with you is my best use of time. I love your choice in cars. You are the best parent. Or you would be a great parent. I think your ethnicity is so cool and unique. I appreciate how well you keep eye contact with me when I talk. I don’t know how you do all you do and still have time to be a great parent, teacher, sibling, aunt or uncle, etc. You have such a great vocabulary. You persevere through anything and you inspire me because of it. I appreciate your taste in music. You have the most interesting perspectives. Thank you for all the value you have brought me. You have such a good work ethic. You are such a hard worker. I love how much you believe in the causes you support. You are the most kind person I have ever met. You are always so committed to whatever you do. You are the perfect example of the best human. You always keep your word. Because of you, I believe in myself. I never would have thought I could have such a good friend, parent, sibling, cousin, etc. I love the way you challenge me. I see you doing great things with your life. You could become president if you wanted to! You have kindness in your eyes. You are the most unique person I know and have ever met. I feel so alive when I am with you! You are always so optimistic at work. You are pretty/handsome but your soul is even more beautiful. You make me feel as if I am whole. I can be open and honest with you about anything. I feel reassured when I am with you. There should be a big statue in the city because of how awesome you are. Spending time with you is the best use of time. You always give the best advice. You are so incredibly selfless. Mother Theresa has nothing on you! You are going to make an awesome parent. You are the definition of unconditional love. I am so proud of all you accomplished. I always feel like we never left each other even after days, months or years after not talking. You are a friend but are more like family! I think about you a lot! I want to carve our initials in every tree in the world! You are the last missing piece to my puzzle. There are 86,400 seconds in the day and from each one, my love for you grows. You inspire me to be and become better. I can’t wait to live this life with you and only you. Because of you I can learn to accept my flaws. Life would lose it’s meaning without you. I can’t wait to grow old with you. You keep getting more beautiful/handsome with age. You are one fire! So HOT! Whenever I think about you, I can’t help but smile. I feel so honored and privileged to be dating or married to you. You help me reach my full potential. You make me feel so loved. You are the meaning of my existence. I say yes to our marriage/relationship every day. I give thanks every day for you. I feel so handsome/pretty because of you how treat me. I will support you no matter what happens in this life. We are a power couple! No one has ever treated me as good as you do. You look beautiful/handsome even when you first wake up! I love every single thing about you. I can’t wait to have kids with you. I am married/together with a winner! You are more perfect than I could have ever prayed for. You’ve changed my world for the better. I feel so safe when I’m around you. You understand me better than anyone. You always make me laugh and smile. I am so thankful you choose me. I miss you even after I just saw you. Your love gives me super human strength. I know that everything is going to be OK when I look at you. I see you in every part of my future. I want you to have all the happiness in the world. I work harder every day to earn your love. I commit to this relationship for life. I can’t wait to do life with you. I can’t wait for date night! You are my dream man/woman. You are drop dead gorgeous/handsome. You handle everything with grace. How can I help you with your goals and dreams? You have and will always take my breath away. I love your insight on things. Thank you for being faithful to me. My eyes are only for you. I love snuggling with you. I can completely be myself when I am around you. I love showing you off to my friends and strangers! I love that you are all mine! Love isn’t even a good enough word to describe my feelings about you. I want to spend every single Valentine with you as Valentines. You can have my heart or we can share it like the last slice. I’ve seen you grow so much. You have so much inner and outer strength. I work hard every day to earn and deserve your love. You are all that I will ever need. I must have done something right to have attracted you into my life. I promise to always give our relationship my all. I still DO, EVERY DAY. You are the woman/man of my dreams and then I can wake up and you are my reality. I’m still falling for you everyday. They say nothing lasts forever, well thats BS. My love for you will last forever. Will you marry me again and again and again?! I’m so glad you choose me over everyone else. No matter how good or bad things are, I will be there going through it with you. You make me grow as a person every day. You are the oxygen to my lungs. I am my best version of myself because of you. I think you are a supermodel! I never want to do this life without you! You make the small things feel big! Life with you feels so natural and beautiful. I will always keep it real with you. Before we met, I never knew I could ever be in love this much or this happy. I feel so great about my future because you are a part of it. We are going to have or have the best looking kids of all time! You are the eptitomy of the best husband/boy friend, wife/girl friend. I would love you no matter how you look! The world falls away when I am in your presence. I forget about everything bad when I am with you. Thoughts of you make me feel warm and fuzzy! If reincarnation is a real things, I know I will always find you and marry you in every life we life. You are the first thing I think about when I wake up and the last thing I think about when I go to bed. I hope I see you in my dreams. You lead this relationship so well. I am so honored to be yours. I love waking up next to you every morning. I would give up any amount of money in the world for your love. You can do anything your heart desires. You are the best kid of all time! You are so funny and energetic. You are so kind to your siblings, family, friends. You are so helpful around the house! I love being your mom, dad, aunt, brother, etc. I see you as so important! I listen to everything you say. You are the most perfect kid of all time. You are such a good friend to your friends. Always follow your heart in life. You inspire me to be the best parent ever. Even if your scared, you can still move forward. You are the biggest gift in my life. You handled that situation so well. I take so much joy in watching you grow up. You are going to be such a great adult. I love you more than I could ever have imagined. You are becoming such a good young man/woman. You play so well with your friends. Your friends love you so much. You make our house feel like a home. I wish I had a friend as good as you when I was growing up. You look cool/nice in that! I couldn’t have hoped for a better son/daughter. I wish all kids were just like you because you are perfect! Even when you are mad, I still love you! I love you this to the moon and back. No matter how old or how big you get, you are still my baby! When you a grow up, you are going to be great. You are a good leader. You always do such good work. You are healthy and strong! You could be president one day! Never let anyone tell you you can’t do something! That was such a kind thing you did! Nothing could ever change my love for you. Always be yourself because you are more than enough and are perfect. You are the first thing I think about when I wake up. Thank you for always being such a great kid! I thank God every day that he gave me you. You give the best hugs and cuddles. I can believe you did this all by yourself, that is awesome! How did I get so lucky to have the best kid in the world! You are so polite to people. There is no one quite like you! The way you treat me as a momma or daddy makes me feel so special. Everyone I know says you are the best kid ever! I prayed for you and God gave me an even better kid! You can tell me anything and I would never judge you. You are the definition of an awesome sibling. Even though we hated each other when we were growing up, I never hated you! I am so glad we had each other coming up. You can tell me anything and I will never judge you. Mom and dad are damn lucky they have a son/daughter like you. I love that you are my brother/sister. You are the reason I am alive and sane! No matter how long we are apart, I always feel the same love and easiness around you when we reunite. I hope my daughter/son or future daughter/son be as good as a sibling your were to me or a child you were to mom and dad. You are one of my biggest reasons I want to be a success. The way you live inspires me. You inspired me to pursue the career I am in or going into. You are the best teacher I have ever had or will ever have. I am so glad I got you as a teacher. You have taught me about the subject you teach and about life. You are the perfect example of a teacher. You are the most caring teacher I have ever met. Thank you for believing in me as a student. I hated this topic/subject until you taught it to me. I never grasped this topic fully until you taught me it. I want to be a teacher because of you. I wish you could come with me each year and teach me each year. I will always think about you when people ask me who my favorite teacher is. I will miss you when I leave this school. You are my teacher and my friend. Thank you for inspiring me to do my best. Thank you for devoting extra time to me. I want to continue my schooling because of your teaching. I didn’t like school until I started your class. You saw something in me that I didn’t even see myself. I use the skills you teach me a lot in my life. If I ever need summer school, I hope your my teacher! Thank you for teaching me the value of education. Thank you for working tirelessly to help us. You are truly gifted at your craft. I want you to know that you deserve to get paid a million bucks a year because you are such a great teacher. I liked the subject you teach but now I love it. You lead the class so well. The entire class is reflection of your teaching, and it is the best class I have ever been in. Thank you for being tough on me when you needed to be in order to help me learn and grow. I hope to see you out in the real world! You deserve the biggest apple in the world that says “Best Teacher Ever” on your desk. Heck even a apple tree in your name! I may not teach in a school, but we are all teachers in some sort, and I will hope to teach and impact the person I am teaching like you have on me. Even though we didn’t work out, I learned so much from you. I am a better person because of our relationship. I will always cherish what we had. I believe you will find true love one day. We are not bad people, just bad together. You are still beautiful/handsome to me even though we didn’t work out. I still have your back. Call or text me anytime if you need anything. I hope to be as smart as you when I grow up. You are so kind and caring. Your next or current significant other is lucky to have you! Hey, maybe well get it together in the next life time! Don’t ever feel like I hate you or have ill feelings towards you, I don’t. Wherever life takes you, just know you can call me or text me to talk or just vent. I may not be in love with you anymore, but will always have love in my heart for you. I have grown as a person so much from dating you. I want to be mad at you, but simply can’t! Maybe in a parallel universe we ended up working out! Even still, when our old song comes on, I have nothing but fond memories to think of. I want your happiness more than I want to try and force this relationship to work. Maybe we will grow as people and find each other down the road. I will always cherish the fun times and the loving memories of us. I am so glad we dated. You showed me all the potential I had in myself. When I see you out and about, I will always say whats up! I will never be awkward! Say hello when we see each other out and about! You are the perfect example of a parent. I want to be just as good as a dad or mom to my children. I am so glad you are my mom/dad. You raised me so good. You inspire me to become great. Because of you, I am all that I am. Thank you for giving the life you never had. I hope to raise my kids as good as you did. You are the perfect example of what every parent should aspire to be. I am so glad I was born to you. I am thankful that you brought me to this earth. I am sorry I was so tough to raise, but thankful you raised me! I will take care of you when you get old. I pursued my dreams because of you. I seriously don’t know where I would be without you. I know I can always lean on you for strength. I can’t wait to learn more and more from your wisdom. No matter how old you get, you will always be beautiful to me because you are my momma and daddy. You are the best looking mom or dad there is! You fed me so well that is why I grew up strong and tough! Thank you for your tough love that you gave to me, even though trying to be my friend would have been much easier. Teach me your lessons about teaching kids! Tell me how I can make your life better. My favorite quality about your parenting was X. You have raised the perfect son/daughter. I see so many great qualities in your son/daughter that reflect your parenting style. I am so honored to be dating/married to your son/daughter. I hope to be just as good as a father/mother as you have been to my wife/husband. I hope you can look at me like a real son or daughter one day! Your son/daughter treats people so well, and I know it is because of how he/she was raised. I hope we can create a great relationship. I will always support your son/daughter. Thank you for giving me the blessing to date/marry your son/daughter. I hope that we can create a family as beautiful as you have one day. You have the most beautiful relationship with your spouse. Can you tell me the secrets to having such a great marriage. Can you tell me the secrets of raising such a perfect son/daugther? I can’t wait to spend the rest of my life with your son/daughter. You need to write a book on raising the perfect kid! I hope you can see my like your own daughter/son one day. I am always trying to earn your love and respect by treating your son/daughter with the utmost respect and love. Whenever I come over to your home I always feel like I am completely loved and welcomed. You make house home when I come over. I look forward to building better and better relationships with you guys over the lifetime of our marriage. Can I take you out for lunch every week? I want to become best friends with you guys! How can I better treat your son/daughter because they deserve the best. I draw inspiration from you through the way you brought up your son/daugther. I hope our son or daughter will see how valuable their grand parents are. My life has become better of course because of your son/daughter but because I adopted you as my second parents. How are you single and that gorgeous/handsome? Any person that gets into a relationship with you is going to be so lucky. Ok, yes I like you, but who wouldn’t and why wouldn’t I? Your perfect! Your hair looks great, always! I have known you for X amount of years and you continue to get more and more beautiful. I have a kindergarden crush on you. I am totally crushing on you! I feel like a little kid when I am around you, all giggly and awkward because I am crushing! You have the most beautiful voice. You are very attractive and your prove that fact every single day. How does someone look so great every day? I am just so incredibly drawn to you! You bring such great energy to wherever you go. I smile every time you walk in the room. Can you just smile all day because you have the perfect smile. Did it hurt? Falling from heaven. Because your an angel! So, I need your help. Taking you out of a date. It takes two people to complete the job. So, what is your favorite food? Oh, really? I know a great place for our first date that serves it! Can you make my life and go out with me? How about we get dinner sometime, a snack heck even water! We would be a power couple if we dated, come on, admit it! I seriously can’t stop thinking about you. I’m no fortune teller, but I think I see myself pretty clearly in your future! Your work ethic is so inspiring! I love coming to work when you are here. You are my favorite person to work with at this job! The only thing better than you at this job is the coffee! Your a close second though! I hope I work with you here for a really long time. If we ever part ways, we need to stay in touch and be friends forever. I hope I work with people like you at my next job. I know you will succeed in any career you go into. You can easily become president of this company one day. I love your commitment to excellence that you bring to the job. You treat this job like a career. You always do more than required around the office. Work doesn’t feel like work when you are around. You bring a really good energy into the office. I will always remember you when I leave this job. You are my favorite person to share our lunch breaks with. You inspire me to work harder and be better. I can’t wait to get to work knowing you are on the schedule. I want the best for you professionally. You keep your desk super easy. While everyone else is talking around the office, you are at work and are diligent. The clients and people that come into the business love you. Show me your ways on how to be so successful! Your professional future is bright for you! I would refer you to anyone who is looking for a great employee. I am always going to put you on my list of contacts for future employers to call to validate my work ethic. Thank you for helping me at work I have learned a lot from you. You are a great leader around the office. You are always dressed so nicely at work. You are the definition of a professional. You give more value than required. I tell people about how hard of a worker you are. If I need to partner with someone on a project, you are always my go to! Home doesn’t feel like home until you get home! What do you want me to cook you for dinner! Now matter how long the day was, I always know I have you to come home to! I hope you have or are having the best day ever. I know you are at work, but I just wanted to tell you I appreciate all you do for our relationship and love that you are the hardest worker I know. You are the reason I am smiling right now. I never knew I would love you this much! You always make my heart melt. Your taking forever to get home, but I would wait all of eternity for you. I can’t stop thinking about you! My life is perfect because you are in it. Just thinking about you makes me get butterflies. I can’t wait to hold you when we see each other! My love that I have for you is eternal. I love reading your texts and hearing your voice come through them. I look forward to seeing you all day at the end of the day! I can’t wait to watch movies and cuddle with you tonight! You know you are gorgeous right? I want to act like I am sick at work so I can come home to you! I appreciate how wise you are. Age is just a number, you are beautiful or handsome regardless. I have learned so much from your knowledge. Are you aging in reverse?! I am so privileged to know you and learn from you. Tell me something about your past that makes you smile. I hope I grow to be as wise as you. Your eyes are so kind. Tell me your favorite memory of this life! Thank you for giving me a chance to be alive. Thank you for giving me the oxygen and resources to keep me alive and thriving. I am grateful for all the people in my life. I have faith that I will get past this. I love life and am thankful for all the things that are coming into my life. So there you are my friends in personal development and happiness! Nice things to say to the people in your life. Things that can and should be said to people to make them feel fantastic. Giving you a list of ways to make peoples day. And in turn make your own day. You can be that person that can act as a reinforcement for what someone feels about themselves. Or even drastically alter how a person looks at themselves or life in general. Allowing you to sprinkle positive legacy everywhere you go. And make life that much more beautiful than how you found it. Share with my what your favorites were and if you have any goods compliments to add in the comment section below!